Practical workshops will arm attendees on how to protect their idea, write a business plan, develop a marketing strategy and research the market using the libraries’ up-to-the-minute intellectual property and business databases. The Business & IP Centre in Leeds Central Library will launch Start-up Day this Thursday (21 September) as part of a national drive to celebrate the region’s next generation of entrepreneurs. The day will be jam packed with free workshops, talks and events at the library to equip budding business owners with the tools to turn their start-up dreams into reality. In the last year alone Business & IP Centre Leeds has supported over 1550 people to set up and grow new businesses. Many of these businesses were led by groups which are traditionally under-represented in the business world: this year 53 per cent of businesses established were owned by women and 37 per cent by people from black and Asian minority ethnic backgrounds. The British Library Business & IP Centre, and the National Network of Centres, will open their doors to over 2,000 aspiring entrepreneurs keen to hear from a stellar line-up of seasoned business experts who’ll be sharing their know-how and insider tips. Names behind some of Britain’s biggest brands will inspire the next generation of entrepreneurs. Speakers from Virgin StartUp and Google Digital Garage will be on hand to advise aspiring entrepreneurs on issues surrounding funding and maximising their online impact in today’s digital age. Practical workshops will arm attendees on how to protect their idea, write a business plan, develop a marketing strategy and research the market using the libraries’ up-to-the-minute intellectual property and business databases. Research indicates that businesses who start up a business with the support of the Business & IP Centre network have a far greater chance of being successful. Currently in the UK over 60 per cent of businesses fail within the first three years of trading, but a recent independent evaluation has showed that 90 per cent of businesses that started up with the help of the Centre were still trading after year three. The British Library Business & IP Centre exists to protect and grow successful businesses. The Centre provides free access to the UK’s largest collection of intellectual property resources, market research and business data, coupled with free and low-cost training, one-to-one support and networking events in an aspiring and accessible space. Since 2012 the Library has been rolling out its model for business support to other UK city libraries, and currently heads a co-branded network of 10 partner Business & IP Centres offering comparable services to current and aspiring entrepreneurs across the country. 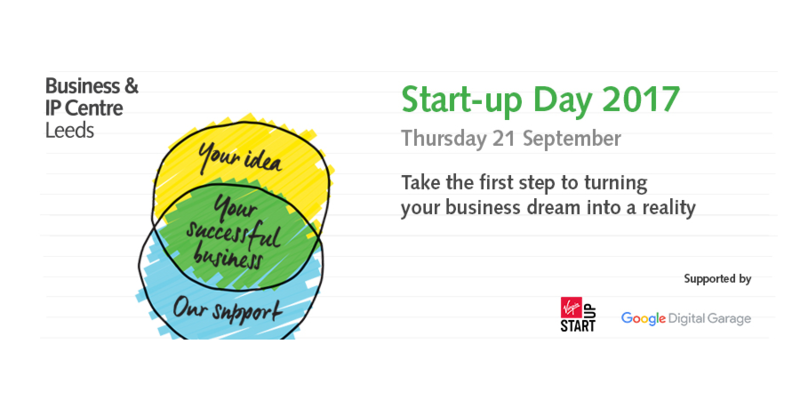 The British Library Start-up Day 2017 will take place on 21 September in London (10:00 – 18:00) and will be delivered through the National Network of Business & IP Centres, as well as through partner and branch libraries in other locations around the UK. National Network cities participating in Start-up Day 2017 are Birmingham, Barnstaple, Exeter, Hull, Leeds, Liverpool, Manchester, Newcastle, Norfolk, Northampton, Sheffield. Other cities who will be joining in are Aberdeen, Glasgow, Nottingham and Worcester.